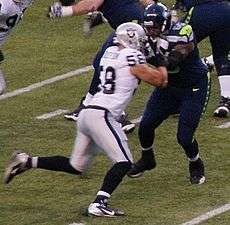 Dave Tollefson being blocked by Frank Omiyale of the Seattle Seahawks. Dave Tollefson (born May 19, 1981) is a former American football defensive end. He was selected by the Green Bay Packers in the seventh round, with the 253rd pick of the 2006 NFL Draft. He played college football at Northwest Missouri State. Tollefson won two Super Bowls as a member of the New York Giants, defeating the New England Patriots in both Super Bowls. Tollefson was born in Walnut Creek, California and attended Ygnacio Valley High School in Concord, playing football for head coach Tim Murphy. He was a two-time All-League and All-City selection as a linebacker. He also played Tight End. During his senior year, Tollefson transferred to Olympic continuation school in Concord, CA and later obtained his high school diploma. Dave Tollefson played outside linebacker at Los Medanos College in 1999 and 2000, and Fresno State University awarded Tollefson an athletic scholarship for defensive end. However, he suffered a series of injuries that made him miss three seasons. He missed the 2001 season due to right shoulder surgery to repair a torn labrum. Then, he spent the 2002 season working at Home Depot, undergoing surgery on his right shoulder to clean up debris. In 2003 he enrolled at Northwest Missouri, but did not play; he was granted a medical hardship after suffering a broken bone in his right foot in August camp. He said that the summer before entering Northwest Missouri, he worked as a carpenter. In the 2004 season he was an All-MIAA second-team choice in his first year at Northwest Missouri. He started twelve games at right defensive end and recorded 48 tackles (19 solos) with 8.5 sacks and 13 stops for losses. He also caused and recovered a fumble and had a pair of pass deflections. In 2005, as a senior, he started fourteen games at right defensive end, recording 58 tackles (38 solos) with a team-high 16.5 stops for losses and five quarterback pressures. He set a school single-season record, and ranked 13th in the nation, with 12.5 sacks, caused a fumble, blocked a kick, and deflected four passes. As a result, he was named First-team All-Mid–America Intercollegiate Athletics Association, was the league's Defensive MVP, was named to the All-Southwest Region team, and earned College-division All-American First-team honors from the American Football Coaches Association. He was also a finalist for the Gene Upshaw Award, given to the best lineman in the small college ranks. At Northwest he was coached by Mel Tjeerdsma who took the Bearcats to five consecutive Division II national championship games between 2005 and 2009. During his years the team went to the quarterfinals in 2004 and the finals in 2005. In 2011 he personally paid for the Northwest jerseys at the request of Scott Bostwick who as defensive coordinator had brought him to Northwest. Bostwick had succeeded Tjeerdsma in 2011 but died of a heart attack before the start of the 2011 season. His wife is Megan (née Stalder), a former Northwest softball player. The Green Bay Packers drafted Tollefson as their last pick of the 2006 NFL draft. He failed to make the final 53 man roster; however, he was added to the Packers practice squad. Tollefson spent the whole 2006 NFL season as a member of the practice squad. Tollefson played with the NFL Europa team Berlin Thunder under a futures contract he signed with the Oakland Raiders. The Raiders signed Dave Tollefson from the Packers practice squad before the 2007 NFL season, but he was waived by the Raiders during the final round of cuts. The Raiders allocated Tollefson to the Frankfurt Galaxy of NFL Europa. Tollefson enjoyed good success for the Galaxy, recording 4.5 sacks, 25 tackles and 5 passes defensed. After spending 2013 out of the NFL, Tollefson announced his retirement on February 14, 2014. Wikimedia Commons has media related to Dave Tollefson. 1 2 3 4 Litsky, Frank (January 17, 2008). "Giants' Tollefson Started as Packers' Final Pick". The New York Times. Retrieved January 13, 2011. ↑ "Dave Tollefson". Packers.com. 2008-02-29. Archived from the original on May 5, 2007. Retrieved 2008-06-19. ↑ "Former Players Chris Griesen and Dave Tollefson Involved in Pro Playing Careers" (Press release). Northwest Missouri State University. April 6, 2007. 1 2 Eisen, Michael (October 2, 2007). "10.2 Roster Moves". Giants.com. NFL. Retrieved January 13, 2011. ↑ Garafolo, Mike (18 September 2011). "Unheralded Dave Tollefson filling in nicely along defensive line for Giants". The Star-Ledger. ↑ "Dave Tollefson: Career Stats at NFL.com". www.nfl.com. Retrieved 2016-04-06. ↑ "Dave Tollefson Announces Retirement". www.giants.com. Retrieved 2016-04-06. ↑ "Dave Tollefson". ESPN.com. Retrieved 2016-04-06.